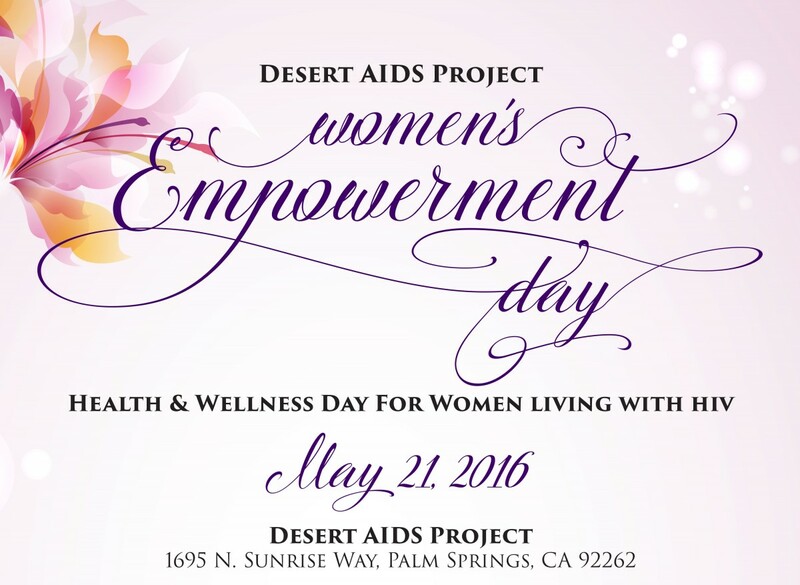 The female clients of Desert AIDS Project will be front and center, as they receive manicures, massages, and sisterly love during the second annual Women’s Empowerment Day on May 21 … and it’s going to be all about health and wellness for women living with HIV and AIDS. They’ll learn more about their unique health and emotional issues from leading specialists. A favorite from last year’s event, Dr. Laveeza Bhatti, MD, PhD., Director of the Hep C/HIV Co-Infection Clinic at AIDS Healthcare Foundation in Los Angeles, is returning with more good advice. Dr. Bhatti is an infectious disease specialist, who has worked with female HIV-affected patients for years. Dr. Bhatti will be joined by Jill Gover, PhD., director of Mental Health Services at The LGBT Community Center of the Desert. As a clinical psychologist, Dr. Gover specializes in addiction, anxiety, depression, aging, and LGBT issues. “The Women’s Empowerment Day is important because we want our female clients to know we’re here to support their needs, just as we do their male counterparts,” says Brett Klein, Events and Retail Marketing Manager, who, along with Denise Marvel, Human Resources Coordinator, is organizing the day. Brett noted he and Denise want to introduce women to the many workshops, support groups, and alternative therapies offered at D.A.P. Janine Bell, Substance Abuse Specialist who leads our Women’s Empowerment Group, explains that reaching women, who comprise about 5% of D.A.P.’s client base, is difficult because they’re not as “out” about their HIV-positive status as gay men. Many of them are low-income single mothers who don’t hang out around D.A.P.’s campus and mingle. “After completing their medical, dental or case management appointments, they bolt,” Janine observes. That’s why Brett feels it’s important for D.A.P. to extend a special invitation to women to let them know that D.A.P. is here for them, too. Last year, Dr. Bhatti explained HIV from a woman’s perspective and fielded questions that were both illuminating and touching. There were tears and reassurance among the audience of about 18 women, who shared their experiences. Dr. Bhatti applauded the size of the crowd saying it was unusually large for an event held by an AIDS service organization for women. The second annual Women’s Empowerment Day will be held from 9:30 AM to 4 PM. on May 21 at D.A.P.’s main campus. The “safe space” day will include a session on building confidence and coping skills, a back-to-work career building seminar, breakfast, lunch, manicures, and massages. Childcare services are available on request. If you’d like to attend, please RSVP on or before May 11 by calling 760.992.0419.